KNOXVILLE, Tenn., Nov. 10 — Samuel and Milton Hodge, both colored brothers, were hanged here to-day in the presence of about 8,000 persons. The doomed men spoke for about ten minutes, each saying they were prepared to die and were “going home to glory.” They warned those present to beware of their fate. As the black cap was pulled over Milton’s face, he sang in a strong voice “Going Home on da Even’ Train,” and Samuel was singing “Going Home to Die no More,” when he was choked by the rope. The crime for which the Hodge’s [sic] were hanged was the killing of their brother-in-law, James McFarland, over a year ago. Christopher Alexander (“Alex”) Haun was perhaps the finest potter in antebellum Tennessee. He never had the chance to become the finest in post-bellum Tennessee because he was hanged in Knoxville this date in 1861 as an incendiarist. While Tennessee seceded with the Confederacy in the U.S. Civil War, East Tennessee was a Union stronghold. This was the native soil of pro-Union “War Democrat” (and future U.S. President) Andrew Johnson. Soon after the war began, Unionist east Tennesseans started slipping over the border to northern-controlled Kentucky, where they hatched a plot to burn railroad bridges throughout East Tennessee. Besides being good fun, the conspiracy promised an effectual blow against the Confederacy inasmuch as the East Tennessee & Virginia and East Tennessee & Georgia lines constituted the South’s most reliable rail and telegraph link between its capital at Richmond, Va., and the Deep South. This plan’s author, Rev. William Carter, went to Washington and had his scheme personally approved by President Abraham Lincoln, Secretary of State William Seward, and Gen. George McClellan. The rest of the plan called for the Union army to invade East Tennessee on the heels of the bridge-burnings and occupy the area. Just a few months before, McClellan’s troops had similarly occupied the pro-Union western mountains of secessionist Virginia, which is why there’s a state of West Virginia today. But there’s no state of East Tennessee, is there? The bridge-burning conspiracy would go down as one of the great, failed guerrilla operations of the war. With authorization straight from the top, the conspirators got going. A Captain David Fry** was tasked with targeting the Lick Creek bridge, located in northeastern Tennessee† near the settlement of Pottertown, so named for the ceramics craftsmen attracted to the area’s excellent clay. Then a party of some 40 to 60 mounted raiders stole out for the Lick Creek bridge two miles distant. Around 2 a.m., they overpowered the small Confederate sentry detail assigned to Lick Creek, and forced the sentries to watch as they fired the bridge. That same night, several other parties elsewhere along the line all the way down to Alabama also burned, or tried to burn railroad bridges and cut telegraph lines. These “deep-laid schemes … by an organization of Lincolnite traitors” (as the Knoxville Register accounted matters) brought a predictably furious Confederate response — and the audacious saboteurs would discover only after the fact that the planned East Tennessee invasion had been aborted by William T. Sherman without alerting his pyrotechnic fifth-column allies. Within three days of the “treason,” East Tennessee had been clapped under martial law. A number of bridge-burners were also arrested (although many others escaped), and here the Lick Creek men would pay dearly for their recklessly humane decision to release their captured sentries. (pdf) As a result, several of them were captured in the days following their attack. Confederate Secretary of War Judah P. Benjamin had a ruthless order for East Tennessee’s military authorities. I now proceed to give you the desired instruction in relation to the prisoners of war taken by you among the traitors of East Tennessee. Second. All such as have not been so engaged are to be treated as prisoners of war, and sent with an armed guard to Tuscaloosa, Alabama, there to be kept imprisoned at the depot selected by the Government for prisoners of war. Two men, William Hinshaw (often called “Hensie” in the period’s reports) and Henry Fry, were condemned by such a tribunal on Nov. 30 and immediately hanged — their bodies left exposed at the Greeneville Station for a day or more, until the stench became overpowering. Haun was condemned on Dec. 10.‡ Confederate Brigadier General William H. Carroll telegraphed Benjamin for Jefferson Davis‘s confirmation of sentence. The court-martial has sentenced A.C. Haun [sic], bridgeburner, to be hung. Sentence approved. Ordered To be executed at 12 o’clock tomorrow. Requires the approval of the President. Please telegraph. Benjamin replied within hours, telling Carroll to make with the noosing. Execute the sentence of your court-martial on the bridge-burners. The law does not require any approval by the President, but he entirely approves my order to hang every bridge-burner you can catch and convict. Haun takes leave of his pregnant wife and four children before execution. 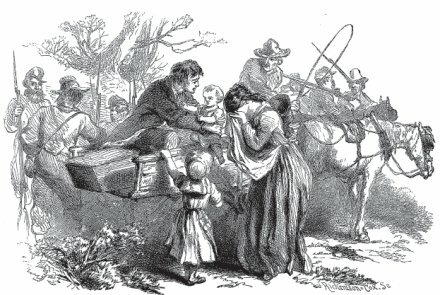 Illustration from this 1862 propaganda volume by the Unionist publisher of the Knoxville Whig. Six days after Haun hanged at Knoxville, the landowner who hosted the conspirators, Jacob Harmon, also went to the gallows, along with his son Henry. It seems someone in the incendiary party had carelessly dropped the name “Harmon” in conversation while the bridge sentries were in custody within earshot. Today, the Harmons are buried at Pottertown Harmon Historic Cemetery in rural Green County, Tenn., where a hexagonal monument commemorates all five executees (with an extra panel for summary text). There’s an annual ceremony there to commemorate the East Tennessee bridge burners. Or, pay your respects any time by using the cemetery as the trailhead for the Civil War Bridge Burners’ Bike Ride (pdf). You’ll find the spot just off Bridge Burners Blvd. All the hanged incendiarists were posthumously enrolled in Company F of the 2nd Tennessee by Congress in 1862, a gesture of appreciation which also conferred on their heirs the right to survivors’ benefits. In addition to the resources linked here, see Donahue Bible’s “Shattered like earthen vessels,” Civil War Times, Dec. 1997. * Later to become the East Tennessee, Virginia & Georgia Railway, and then the Southern Railway, and then a big band hit. 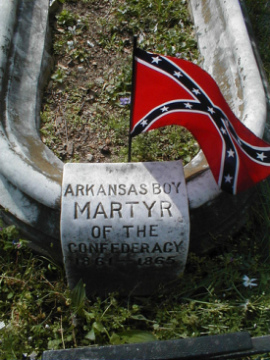 **The intrepid Captain Fry would escape immediate capture, gather a few hundred Unionists as a guerrilla band, and eventually get caught, sent to Georgia, and condemned to death as a spy. Fry escaped by breaking out on the eve of his Oct. 15 hanging, in the company of some of the men arrested for the Great Locomotive Chase. He rejoined Union forces, was captured again, and survived the war, finally dying in 1872 … when he was hit by a train. ‡ The railroad bridge at Lick Creek was back in action by this time.